Breast cancer is the most common cancer among women, with one in nine women diagnosed with this disease during her lifetime. Fortunately, breast cancer cure rates have improved over time and there are currently many effective treatments available. 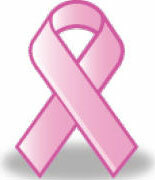 The major risk factor for breast cancer is female gender and older age. Other factors relating to hormones, such as the number of pregnancies, age at menstruation and menopause, and hormone replacement therapy also slightly alter a woman’s risk of breast cancer. Although the majority of breast cancers are sporadic and happen by chance, a small percentage of breast cancers are caused by genes inherited from a woman’s parents that have conferred a higher risk for the development breast cancer. The American Cancer Society recommends that most women should begin to undergo routine yearly screening mammograms at age 40. However, those with a strong family history of breast cancer may need to begin screening at an earlier age. It is also recommended that women perform monthly breast self examinations. The treatment approach to breast cancer depends on how far the disease has spread when it is found. Breast cancer can spread from the breast to the underarm lymph nodes and to areas outside of the chest. The extent of breast cancer is divided into stages, with higher stage numbers indicating more advanced cancer. Stage 0 breast cancer, or ductal carcinoma in situ (DCIS) is a preinvasive form of breast cancer which is extremely unlikely to spread to areas outside of the breast, and has an excellent chance of cure. Stage I-II breast cancer is called “early-stage” and has the potential to spread however, with appropriate treatment has a very good chance of cure. The current standard treatment options for DCIS or early stage breast cancer are mastectomy (surgical removal of the breast) or breast conservation therapy (surgical removal of part of the breast followed by radiation treatment). Chemotherapy or hormonal therapy may also be recommended depending on breast tumor characteristics. Stage III breast cancer is termed “locally advanced” and usually requires more intensive therapy with surgery, chemotherapy, and radiation treatment. Stage IV breast cancer, or “metastatic” disease, has spread to distant sites (for example, the lung, bones, liver, or brain), and is usually treated with chemotherapy and/or hormonal therapy. Women who are diagnosed with breast cancer should speak to their physicians about individualized treatment recommendations. The Women’s Center has several copies available of a “Guide to Breast Cancer” and a whole bunch of pink ribbons. Please stop by and pick one up.